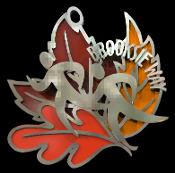 The BROOKSIE WAY Charm combines the iconic Brooksie runners on a colorful fall background. Like all our products, the Brooksie charm is handcrafted from sterling silver with an enameled front to the leaf designs. Sized to fit any necklace or charm bracelet. The charm comes attached to an 18" sterling necklace, and is presented in a gift box.